Poorly immunogenic cancer cells evade host immunity and grow even in the presence of an intact immune system, but the complex mechanisms regulating tumor immunogenicity have not been understood. We recently discovered an unexpected and exciting role of the Hippo intracellular pathway in suppressing immunogenicity. Inhibition of the Hippo pathway in cancer cells leads to tumor destruction by enhancing anti-cancer immunity via a mechanism involving extracellular vesicles. 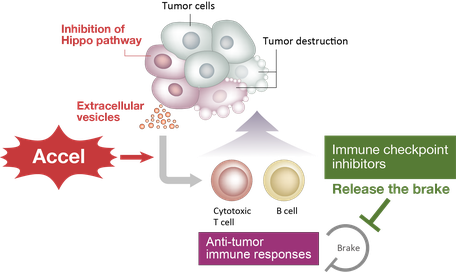 Although the recent development of cancer immunotherapy raises high hope for cancer treatment, a major limitation of the current immune checkpoint blockade is the low response rate. 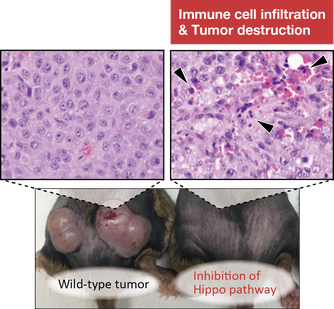 Our observations suggest that the Hippo pathway is a new target for cancer immunotherapy since improving immunogenicity of cancer cells by inhibiting Hippo pathway is a strategy complementary to the current immunotherapy of relieving immune suppression. We aim to provide scientific bases to target the Hippo intracellular pathway for cancer immunotherapy.